Ah, visions of sugar plums (er, strawberries) dance in my head... For me, that vision is the lovely photo images that appear on most food blogs. So many of them have such beautiful pictures, you wonder if these women and men are professional photographers as well as professional foodies. Seeing the images, you are inspired, or perhaps intimated, by the wonderful creations that gleam before you. I've been wanting to add images to my food blog since I started, but I've been falling far short of my goal. But I'm going to try harder, fuzzy images be damned. This is a picture of our family dessert last night, taken with an iPhone. We had strawberries from California (sorry, not local), totally plain, but pretty darn good. The bowl was demolished in a few minutes. Quarter strawberries, toss with a teaspoon of sugar or two and a splash of balsamic vinegar. (Yes, even kids like it!) Terrific if the strawberries aren't sweet enough on their own. Great with vanilla ice cream. Serve with vanilla yogurt and granola for snack or breakfast. For easy shortcake, toast pound cake slices, add strawberries, and top with ice cream or whipped cream. For adults, toss strawberries with a little sugar and a little fruit-flavored liqueur like Chambord or Grand Marnier. 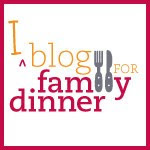 Another thought: Since I'm not selling "beautiful food" on this blog so much as the concept of family dinner, perhaps I would be better served with a podcast of our dinner conversations. Wait a minute, maybe not....might be too incriminating, uh I mean, lively. Entertaining, though, I'm sure. Any tips on photo-blogging or other multimedia effects for me?